This entry was posted on April 27, 2015 by admin. When you purchase a new spa for your home, you don't necessarily get all the accessories you would want to supremely enjoy your investment. Sure, your new spa comes with heaters and pumps required to provide you with warm, relaxing water, but there are multiple accessories available for purchases that enhance the joy of spa ownership. The question is; which accessories are the must-have extras that you should purchase? Now that you've purchased a new spa and had it installed on your patio, deck, or in the backyard, you want to protect your investment from the elements. Whether or not you live in an extreme environment like the desert of the Upper Midwest, there are always natural elements you want to keep out of your spa. A good (and included) cover will keep rain water out, making it easier to control the temperature, and also keep out dirt, dust, and debris that can clog your filters and potentially damage the pump. However, do you want to lift the cover off on your own every time? Spa cover lifts are an affordable solution that make it easy to place and remove the cover on your spa. Some are motorized, while others use leverage to make it easy for you to lift and remove the cover manually. If your spa is the centerpiece of a greater outdoor patio area, you'll want some high-quality pub tables and stools to provide the finishing touches to your environment. Hybrid tables are available in long, rectangular forms, pub-table designs, and half-circle tables. Constructed using Envirotech materials, these tables will not crack, fade, or deteriorate, which makes them a perfect addition to your outdoor entertaining area. Stools made with Envirotech materials are also available to match each table mentioned. There's nothing better than enjoying a nice cold beverage while you're relaxing in your spa. Whether you want to stay hydrated with cold water, sip a cold beer, or entertain friends with margaritas, spa-mount tables are available to help everyone enjoy a drink with ease. As the name suggests, these tables can be mounted to the side of your spa to create storage space where you and your guests can set drinks without worrying about holding them, or spilling them, in the spa. How do you plan to get in and out of your spa? There are a myriad of spa steps available to make it easier for you and your guests to get in and out of your spa. Rather than using cheap ladders or boxes from around the house as a makeshift step, you can purchase attractive, sturdy spa steps to make getting in and out a breeze. Select from a single step constructed out of Envirotech materials, a two-step model made of Redwood for a classic look, or even a half-moon design two-tier step for a unique look. There are plenty of options. Your creativity is the only limit when it comes to adding to your spa with unique steps. With these four accessories, your spa can be more than just a hot tub in your backyard. These accessories add to the value of your hot tub and help create an enjoyable environment that is perfect for entertaining. 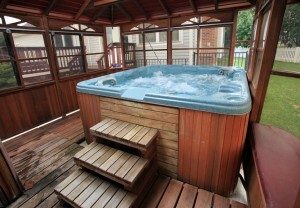 Browse our full selection of hot tub accessories at spasandstuff.com for even more outdoor entertaining options!